Sleep apnea is a disorder in which a person stops breathing several times while sleeping for periods of a few seconds up to two minutes. The disorder is characterized by loud snoring, restless or unrefreshing sleep, a feeling of choking or shortness of breath and daytime sleepiness. 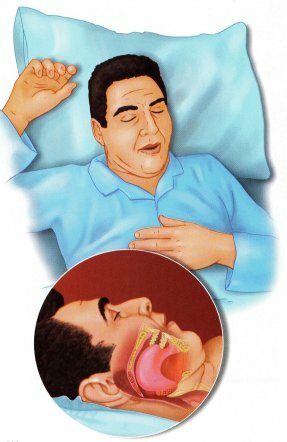 The most common cause of sleep apnea is obstruction or blocking of the airway due to the relaxation of the muscles of the throat and tongue. Sleep apnea is potentially life-threatening, and should be diagnosed and treated as soon as it is suspected. Apnea (Greek for “without breathing”) should be diagnosed in a sleep laboratory, where the specific cause and best treatment can be determined. Simple treatments consist of changes in lifestyle, such as weight loss; avoiding alcohol, sedatives and nicotine; treating nasal congestion; and maintaining a regular pattern of sleeping. Medical devices may help when lifestyle changes fail. In severe cases, surgery may be needed to improve breathing. Some of the risk factors for developing obstructive sleep apnea include excess weight, especially in the neck area; high blood pressure; snoring; or an abnormality in the structure of the upper airway. There are two types of sleep apnea: Central sleep apnea is a rare condition in which breathing stops completely for a few seconds up to two minutes due to a problem with the nerve signals in the brain that stimulate the muscles needed to breathe. It can also be caused by a brain tumor, but the reason for the condition is not always known.Obstructive sleep apnea, the more common type of apnea, is caused by an obstruction or blockage of the airways that lead to the lungs. This blockage is often due to the relaxation of the muscles in the throat and the tongue during sleep, causing an obstruction of the air flowing in and out of the lungs. Obstructive sleep apnea affects an estimated 18 million Americans, mostly adult men and menopausal women. Some of the risk factors include excess weight, especially in the neck area; high blood pressure; snoring; or an abnormality in the structure of the upper airway. Symptoms: The most common symptoms are loud snoring, daytime sleepiness, restless and unrefreshing sleep, a feeling of choking or shortness of breath at night, and the need to urinate during the night. Less common symptoms are nighttime sweating and morning headaches. Most of the symptoms of obstructive sleep apnea are a result of interrupted sleep. Sleep apnea is described in terms of a cycle, and in these patients, the cycle can occur over one hundred times each hour. During a sleep apnea cycle, the patient falls asleep, the throat muscles relax, and the air is blocked from moving in and out of the lungs. This causes breathing to be difficult, often with loud snoring or small snorts. If the air is completely blocked, there may be a pause in breathing. The oxygen in the blood decreases, and the carbon dioxide in the blood increases. The heart rate slows. The brain senses there is not enough oxygen and too much carbon dioxide in the blood, and causes a release of epinephrine, or adrenaline, to cause awakening. The relaxed muscles contract, opening the breathing airway again, and the heart rate and blood pressure quickly increase as a result of the epinephrine release. As breathing returns to normal, the carbon dioxide is exhaled and oxygen is inhaled. Once these gases are again in balance, the patient falls back to sleep and the sleep apnea cycle is repeated. Diagnosis: The diagnosis of obstructive sleep apnea can be made after a thorough physical examination and a test, best accomplished at a sleep disorders center. An overnight sleep study helps to discover when the problems occur in the sleep cycle, the position the patient is in during the sleep apnea, and whether the person is breathing through the mouth or nose when the apnea occurs. This information helps the doctor decide the best treatment for the individual patient. In mild cases of obstructive sleep apnea, depending on the cause of the symptoms, small changes in lifestyle may be very effective. Some of these changes include sleeping on the side and not the back; avoiding alcohol, nicotine, and sedatives; treating nasal congestion; establishing regular sleeping patterns; and losing weight (especially around the neck area). In certain mild cases of obstructive sleep apnea, a dental appliance may help. These appliances are worn at night, and force the jaw forward, enlarging the space behind the tongue helping to avoid airway blockage during sleep. Remember, sleep apnea is a potentially fatal disorder. Be sure to tell your doctor if you have symptoms of sleep apnea.